Grease bread loaf pan (5x9) and set to the side. Puree avocado in a food processor or blender. Set aside. In a mixer, add avocado puree and butter, and mix to combine until creamy. Add in sugar and mix for about 5 minutes on medium speed. Add in vanilla extract, egg and buttermilk, and mix until fully combined. In a small bowl, combine flour, baking soda, salt and baking powder together, and add to the avocado mix. Mix the flour mixture and avocado mixture together until combined. Add in 1/2 cup of chopped pistachios to mixture and slowly mix in. Pour mixture into the loaf pan and bake for 50 minutes. Remove from oven and allow loaf to cool. Once loaf is cooled, mix powdered sugar and lime juice together until smooth. 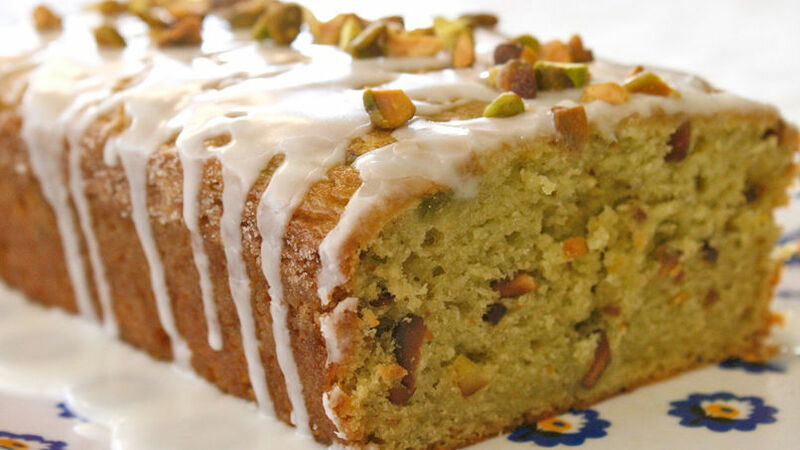 Drizzle lime icing over the top of avocado loaf and sprinkle with remaining tablespoon of pistachios. Enjoy! Coat bottom of loaf pan with wax paper for an easy removal from pan. Once you remove loaf from pan, remove wax paper from the bottom of the loaf. If you’re like me, then you’re a bit hesitant when it comes to any kind of avocado dessert. It’s not like I’m immature about it. I mean, I develop recipes for a living and am totally open minded about almost anything… except for avocado desserts! Recently this has been on my mind quite a bit. I realized that I had to get over this notion and give avocado sweetness the old college try. The big positive about it is the reduction of butter and oil that the avocado would replace. So in a way it would be a healthier version of a loaf! I tried a few different versions and came up with a recipe that I was very pleased with. It is super moist and the lime icing ties all the flavors together evenly and divinely. If you’re looking for a little taste of the California summer in a loaf, give this treat a try for your next picnic or family dinner.